The start of the baseball season is less than a month away. Every weekday until opening day, we'll be counting down, from No. 20 to No. 1, the most important Yankees players for the upcoming 2010 slate. Today, No. 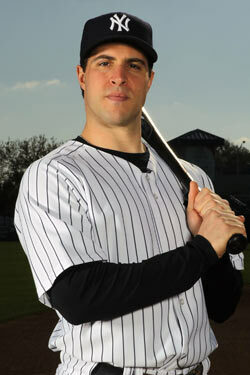 5, first baseman Mark Teixeira. It would be hard to consider Mark Teixeira's first season in pinstripes anything but a success: After signing an eight-year, $180 million contract just before Christmas, Teixeira led the American League in two of the three triple-crown categories and finished second in the A.L. MVP voting. But Teixeira's season was book-ended by a couple of nightmarish months: A notorious slow starter, he hit just .200 in April with three home runs. Then, save for a walk-off homer against the Twins in the ALDS, he didn't do much with the bat in October, either: His on-base percentage didn't crack .300 in any of the three postseason series, and he went a dreadful 3 for 22 against the Phillies. But, oh, those months in between. Despite the ugly start, Teixeira led the Yankees with a .948 OPS, good for third in the American League. Teixeira's monster contract demanded a corresponding monster season, and he obliged. (It's worth pointing out that statistically speaking, his defense actually wasn't as good as advertised: His UZR placed him seventh out of nine qualifying A.L. first basemen.) It was only right that Teixeira rode down the Canyon of Heroes with CC Sabathia: They'll be forever linked by their huge contracts and their arrival dates in the Bronx. And one year in, the Yankees' are getting their money's worth in both cases. Teixeira may not be the face of the franchise like Derek Jeter, or have his sights set on the record books like Alex Rodriguez, but he has something neither of them has: his relative youth. He'll turn 30 next month, meaning while the other mega-stars in the Yankees' offensive galaxy are on their way out of their primes, Teixeira's right smack in the middle of his.